Although Lego has dropped the ball in recent years by creating the Friends series of “Legos For Girls,” they, at least, never armed their minifigures with modern murder tools. That’s where American companies come in, to “liberate” these happy, high-taxation-rate Danish minifigs from their progressive overlords. 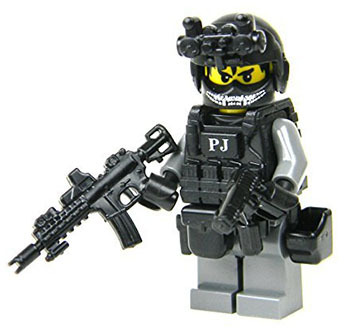 You can now arm your Lego men with Lego-scale M-16s, combat shotguns, dual-wield Uzis, rocket-propelled grenades, or (above) buy a custom-outfitted modern murder-soldier, strapped with magazines and holsters. And just like American soldiers, when they’re done with their tour of duty, there’s no psychiatric Lego hospital to help them work through the trauma.